6.1???? Rescission Motion: Findings of the Odour Testing Free Range Piggery, Tewinga (SF1541, DA2010/031) ? 12.6?? Review of Local Government Engagement with the RFS - Discussion Paper ???? Council has received a petition and several letters regarding the difficulties faced by residents of Marshall Way Nambucca Heads who need to use prams, wheelchairs and motorised scooters to assist with mobility.? The footpath is not wide enough to accommodate such mobility aids and the residents? rubbish bins. 1??????? That Council consider a future budget allocation to widen the footpath on the northern side of Marshall Way to accommodate motorised scooters and other forms of assisted transport. 2??????? That when assessing future development applications for facilities expected to cater for individuals with assisted mobility needs Council consider the adequacy of footpath widths. Council has received a petition and several letters regarding the difficulties faced by residents of Marshall Way who need to use prams, wheelchairs and motorised scooters to assist with mobility.? The footpath is not wide enough to accommodate such mobility aids and the residents? rubbish bins. Marshall Way is home to a significant number of residents who use motorised scooters to access the vicinity of Nambucca Plaza for daily shopping needs and medical appointments.? There is a seniors? living facility on Marshall Way and a preschool. Unfortunately, in order to meet the requirements of our kerbside waste collection, bins need to be left on the footpath and they then cause an obstruction to people needing to use the footpath.? One of the letters received by Council refers to an accident where a motorised scooter tipped over when a rider drove across a sloping layback to avoid bins. If the bins are put on the road itself they become an obstruction to parking.? It appears that the only solution would be to widen the footpath on one side of the street to accommodate the bins and motorised scooters, wheelchairs and prams. This problem is likely to become more frequent in the future given the predicted population demographic for our Shire, hence the second recommendation. A copy of the petition was circulated to all Councillors under cover of a confidential memo. It is suggested that Council consider a budget allocation to enable the preparing a design which will enable the work to be costed.? It should be noted that the rearrangement of design work may impact on Council?s capital works program. Each year the Local Government and Shires Association (LGSA) surveys all 152 councils in NSW to determine the average cost shifting ratio and the LGSA have now released the results for the financial year 2009/10. The survey estimates that for 2009/10 cost shifting amounted to 5.74% of Local Government?s total income before capital amounts or $471 million. To put this into perspective at a local level, based on the state wide average, cost shifting cost this Council $1.76 million.? Considering that a 1% increase on the general rate nets Council approximately $80,000, a 22% rate increase would be required to offset this cost shifting. Cost shifting refers to the act of transferring responsibilities from state to Local Government without transferring adequate associated funding or a means of recovering the actual costs. Each year the Local Government and Shires Association (LGSA) surveys all councils in NSW to determine the average cost shifting ratio and the LGSA have now released the results for the financial year 2009/10. Contributions to the NSW Fire Brigade and Rural Fire Services, lack of adequate funding for public libraries and the NSW government?s failure to reimburse for mandatory pensioner rebates for rates are major examples of cost shifting.? Councils are also denied sufficient financial resources to adequately meet their responsibilities for regulation of companion animals, management of contaminated land, control of noxious weeds, maintenance of Regional roads and bridges, flood mitigation works and administration of environmental regulation. The survey also includes cost shifting associated with the 2008 Local Government election, such as inflated charges and the failure to return revenue from penalty notices (fines for not voting).? In the most recent survey, two new examples of cost shifting were identified and included.? These are the revenue raising restrictions on Council managed Crown lands and the shortfall in cost recovery for assessing development applications (assessment fees are regulated). Cost shifting clearly has a significant impact on Council?s finances.? Across the State it almost equals and in some cases exceeds the annual infrastructure renewal gap of $500 million per annum.? (This is the difference between what should be spent to maintain assets and what is actually spent).? Over the five years that the LGSA have been conducting this survey, cost shifting has accumulated to an estimated $2.2 billion.? This is taxation by stealth on a grand scale. With the additional expense of a Barrister the opinion will not guarantee any further certainty or clarity. That the applicant be given time to address and implement the recommended remediation measures. There are no attachments for this report. ???? Deferred to May 2012 Council meeting. Further deferred to May 2012. Council receive a report regarding extending life guard services over the Easter break, including community education.? Also that the report consider markers for boats to access Forsters Beach at Scotts Head without conflicting with swimmers. The total return on investments from 1 July to 31 March 2012 is $678,812 ? taking into account accrued interest to 30 June 2011. Amount of interest expected from all funds and reserves as per budget is $1,452,000. Council currently has $4.91 Million with Managed Funds, $2.44 Million with On call accounts, $23.50 Million on term deposits and $1 Million in a Floating Rate Term Deposit. This report details all the investments placed during March and Council funds invested as at 31 March 2012. That the Accountants? Report on Investments placed to 31 March 2012 be noted. This report details all the investments placed during March 2012 and Council funds invested as at 31 March 2012. Interest on investments will be assessed with the March 2012 Budget Review.? Variances will be distributed between the Water, Sewerage and General Funds for the second quarter of the financial year. Thanks for the telephone call and your email advice. You advise that the need for a playground incorporating a climbing structure and sand pit at the Unkya Reserve was an outcome of the community planning day conducted by the Unkya Committee of Management in January 2011.? You advise that the Committee has about $2,000 which it could commit to the project. You estimate the total cost of the project to be $40,000 (based on bark chip softfall) and you are proposing to lodge an application for a Community Building Partnership grant which is $ for $.? You are seeking a financial commitment from Council of $20,000 being the matching funding required for the project.? As discussed Council staff are not that keen on bark softfall because of its maintenance requirements and our potential liability if it is not maintained. I advised that Council does not have $20,000 available in its budget for this expenditure and that I can't commit the Council to such expenditure without it being endorsed in a quarterly budget review or in Council's budget for 2012/2013.? Having said that the Council is always keen to support its Committees of Management in their endeavours to obtain grant funds and improve their facilities. In the circumstances that the grant applications close on 31 October 2011, my suggestion is that you proceed to make application for the grant funding.? In the event that you are successful in securing the grant please contact myself and Council staff will investigate the funding of Council's share, including a contribution from the Committee of Management.? Any funding which Council may be able to apply will need to be included in our budget.? Opportunities to review an adopted budget only occur quarterly. I hope this advice is of some assistance. Thank you for your work as a volunteer. I am writing further to a phone conversation we had in April regarding funding for a playground at Unkya.? My apologies; I was supposed to have emailed you our request ,which I have recently realised I didn't do.? My understanding was that Council was making an allocation in 2011/12 budget to allow dollar for dollar up to $20,000?? Could you please confirm this- we are currently preparing an application for a Community Building Partnership grant and as a section 355 Committee are required to match the amount applied for. I am hoping to submit application Friday, so would appreciate confirmation beforehand.? I can be contacted on 65699373. Council has been asked to nominate its representative to Arts Mid North Coast Inc Regional Arts Board. The elected member representing Council for the past twelve months has been Cr Paula Flack. A copy of the letter and nomination form is attached. That Council nominate a representative for the Arts Mid North Coast Board. 1??????? That Council nominate a Councillor to represent it on the Board of Arts Mid North Coast. 2??????? That Council is not represented on the Board of Arts Mid North Coast. Arts Mid North Coast will be conducting its Annual General Meeting on 25 May 2012 and is seeking this Council?s representation on the Board.? As Council is one of their key stakeholders it is seeking a continuation of Council?s representation. Nominations must be received by Arts Mid North Coast prior to 14 May 2012. There is no economic impact as a result of this report. This report has no direct or indirect impact on budgets. This report has no direct or indirect impact on working funds. 1????????? That Council staff investigate and report on the removal of a step, which poses a problem to the public disable toilet in Winifred Street, Macksville. 2????????? That the Traffic Committee investigate the replacement of silent cop at the corner of Estuary Lane and Ridge Street, Nambucca Heads. 1????????? That Council staff investigate and report on the removal of a step, which poses an access problem to the public disabled toilet in Winifred Street, Macksville. 3????????? That the remainder of the Minutes of the Access Committee held on 27 March 2012 be endorsed by Council. Members where concerned that wheelchair access to these public toilets could be hindered by the step i.e. wheelchairs may 'bounce' back into traffic and the amount of effort it takes to manually drive the wheelchair into the toilet. This discussion was around the fact that members witnessed u-turns being made at this one way street. Previously there had been a silent cop in place which caused motorists to use to think twice. That the Committee note the recommendations of the Minutes of the Meeting held Tuesday 28 February 2012, will be presented to Council at its meeting of Wednesday 11 April 2012. There were no recommendations coming from this item. A letter was sent to the BananaCoast Credit Union in relation to ATM in Nambucca Heads and the removal of the step. Members are waiting for a response from the BCU's main office. That Council staff investigate and report on the removal of a step, which poses a problem to the public disable toilet in Winifred Street, Macksville. That the Traffic Committee investigate the replacement of silent cop at the corner of Estuary Lane and Ridge Street, Nambucca Heads. That the access committee discuss the possibility of engaging in future community projects. The next meeting will be held on Tuesday, 24 April 2012 commencing at 2:00 pm. This meeting will be the AGM with an ordinary meeting to follow. There being no further business the Chairperson then closed the meeting the time being 4:00 pm.? Attached for Council?s endorsement is a copy of the Minutes of the Nambucca River, Creeks, Estuary and Coastline Management Committee Meeting held on Friday, 30 March 2012. There are several recommendations from the Committee coming from the Draft Nambucca River Coastal Zone Management Plan, which require an action of Council. a??????? Keep the 4WD track open and operational as an interim measure. b??????? Maintain the track surface to a serviceable condition for emergency access, restore/ rehabilitate track margins and provide drainage to reflect natural regimes as much as practical. c??????? Install signage at the track entrances about safe and responsible off road vehicle driving and the sensitivity of coast dune and wetland habitats to disturbance. d??????? Conduct more detailed feasibility assessment of potential alternative routes within the Valla Beach area. Noting other sensitive ecological communities and coastal landforms as well as engineering and safety requirements of alternative routes . e??????? Advise local 4WD clubs/fishing clubs, emergency services and the authority responsible for Wenonah Headland 4WD access that Council is considering alternative off road vehicle access arrangements for North Valla Beach and seek their feedback on providing emergency vehicle access only, or track closure, or the feasibility of other potential local routes or other options further north along the beach. f???????? Investigate means and opportunities for educating persons using the beach to reinforce safety issues (interactions with other beach users) and responsible driving. g??????? Continue to monitor the condition and use of the existing access track (e.g. how many vehicles a month and when does peak use occur). h??????? Depending on the outcomes of these further feasibility studies, driver education and consultation, the matter be reported back to Council for further consideration. Partial closure (except for emergency vehicle access) or full closure and rehabilitation are possible options. 2????????? That management actions for Hyland Park pedestrian link to the bridge and the access to black rock area be incorporated into the actions of the CZMP. Management Actions for both areas are to include monitoring and management on an as needs basis. 3????????? That the draft CZMP plan be amended where necessary to ensure correct referencing of government agencies and minor wording amendments throughout the document to clarify responsibilities, approval requirements, partnership relationships and the significance of ecological values along the Nambucca coast. 5????????? It is recommended Council review the Section 94 Plans for Surf Life Saving equipment/facilities taking into consideration coastal process issues that may affect the function and safety aspects of the Surf club facilities and surrounding precincts. Precinct plans for Scotts Head Surf Club and Nambucca Surf Club would be required to fully cost works. 6????????? It is recommended Council investigate feasibility of a S94 Contributions Plan for the Coastal Zone Management Plan Implementation. Taking into consideration matters identified as short term priorities within the Coastal Zone Management Plan. 7????????? It is recommended Council prepared a S94 Plan for the Valla Beach Footbridge. The Catchment area to include the Valla Urban Growth Area. That Council review its Section 94 Plan for Community Facilities and investigate opportunities for including Surf Life Saving equipment/facilities taking into consideration coastal process issues that may affect the function and safety aspects of the Surf club facilities and surrounding precincts, funding matters identified as short term priorities within the Coastal Zone Management Plan and consideration of including the Valla Beach Footbridge with the Catchment area to include the Valla Urban Growth Area. 8????????? That a submission be made to the Catchment Management Authority seeking funding for the construction of a bridge or culvert duplication for the access to Stuart Island and also investigate to have this on the Catchment Plan for 2012-2020. b??????? Maintain the track surface to a serviceable condition for emergency access, restore/rehabilitate track margins and provide drainage to reflect natural regimes as much as practical. 4????????? That minor wording changes are made to ensure that the document is directly aligned with any specific layout or wording requirements of the NSW Guidelines for Coastal Zone Management Plans. 5????????? That Council review its Section 94 Plan for Community Facilities and investigate opportunities for including Surf Life Saving equipment/facilities taking into consideration coastal process issues that may affect the function and safety aspects of the Surf club facilities and surrounding precincts, funding matters identified as short term priorities within the Coastal Zone Management Plan and consideration of including the Valla Beach Footbridge with the Catchment area to include the Valla Urban Growth Area. 6????????? That a submission be made to the Catchment Management Authority seeking funding for the construction of a bridge or culvert duplication for the access to Stuart Island and also investigate to have this on the Catchment Plan for 2012-2020. 7??????? That the remaining Minutes from the Nambucca River, Creeks, Estuary and Coastline Management Committee Meeting held on Friday, 30 March 2012 be endorsed. In addition to the members of the Nambucca River Estuary and Coastline Management Committee, all Councillors were invited to attend the Meeting as the Nambucca Coastal Zone Management Plan was on the Agenda and Ms Pam Dean-Jones was in attendance to present the outcomes of the exhibition and proposed amendments to the Draft Plan on behalf of the Consultants, Umwelt Australia in conjunction with SMEC Australia. The Committee made a number of recommendations in relation to this Draft Plan and other matters on the Agenda, which are contained in the summary above. Councillors are requested to bring their hard copy of draft Plan to the meeting should any discussion or clarification be required. That the Committee note the adoption and resolutions in relation to the Minutes of the Meeting held 18 November 2011, by Council at its meeting of 1 December 2011. There has been confirmation from Manly Hydraulics who have confirmed they have looked at sites at Twilly Willy, Gumma, Highway Bridge over Scotts Head Road and Wilson Bridge, in relation to River Gauge Postsmet. They have also met with SES. Questions ? does Council want gauges in the water or above high tide level. If they are in the water, they will need to be maintained every 6 months. Manly Hydraulics would provide upgrade of gauges. 5????????? It is recommended Council review the Section 94 Plans for Surf Life Saving equipment/ facilities taking into consideration coastal process issues that may affect the function and safety aspects of the Surf club facilities and surrounding precincts. Precinct plans for Scotts Head Surf Club and Nambucca Surf Club would be required to fully cost works. 7????????? It is recommended Council prepared a S94 Plan for the Valla Beach Footbridge. The Catchment area to included the Valla Urban Growth Area. 1????????? That the Committee endorse the recommendations contained in the review document for the Gumma Creek and Watt Creek Water Quality Monitoring Program prepared by Damon Telfer ? GECO Environmental Services and refer to Green Span Pty Ltd for implementation. 2????????? That a further report come to the Committee in the future when accurate analysis data is available on the sampling of the water quality in Gumma and Watt Creek. That a submission be made to the Catchment Management Authority seeking funding for the construction of a bridge or culvert duplication for the access to Stuart Island and also investigate to have this on the Catchment Plan for 2012-2020. The table contained the actions from the Masterplan and the Estuary Plan. The next meeting will be held on at the end of April or first Friday in May, commencing at 8.30 am. There being no further business the Chairman then closed the meeting the time being 10.30 am. This application relates to an extension of an existing medical centre, though conversion of office space currently occupied by Farringdon Village, and some minor physical extensions. Council resolved at it?s Ordinary Meeting on 11 April 2012 to allow a variation to the car parking standards in this instance, however, the proposed variation was considerable and Council requested the applicant and Council staff look again at possible ways of providing any additional car parking to serve the development. Council staff have analysed various amendments to the existing car parking arrangement and following discussions with the applicant, both parties have preliminary agreed on a revised car parking plan, which will ultimately allow for 10 (ten) on site car parks and the potential for 5 (five) off site parks to be located near by, subject to the approval of Traffic Committee and discussed in greater detail later in this report. This is an increase in 3 (three) additional on-site car park spaces which, although still equates to a shortfall in car parking requirements as per Part C of the NDCP, is still a valuable increase to the existing situation and this combined with the proposed reconfigurations and restrictions of use of the car parks, it is predicted existing car parking arrangement will be improved. That Council approve the application subject to the conditions drafted below and on the basis that Traffic Committee does not support the proposal for the ?1 Hour? parallel parking bays on Marshall Street the Consent remains valid as 3 (three) additional on site car parks will still be provided. Option 2 is that Council approve the application subject to the Traffic Committees approval of the ?1 hour? parking bays on Marshall Way. Option 3 is that Council refuse the application on the basis it does not meet Council?s DCP car parking requirements for on site parking and there is insufficient provision of car parking to be utilised near by. This proposal was previously reported to Council on 11 April 2012 and the report and Council?s resolution are Attachments 1 and 2 for Councillors reference. Since this resolution, Council?s technical staff has suggested some improvements to the existing car parking arrangements. The applicant has also managed to reconfigure the on site car parking and provide a further three car park spaces to the rear of the building, now totalling 10 (ten) on site car park spaces. Council has suggested these new car parks along with the existing one, resulting in four located at the rear of the building, are be utilised by staff on the medical centre. This leaves the existing four at the front of the building to be available for visitors and it is suggested these be limited to a ?one hour? maximum time limitation, which should allows ample time for patients waiting and appointment time, but will not permit doctors or health consultants to occupy them for longer period. A draft revised car parking layout is shown in the plan below at Figure 1 with the staff parking numbered 1-4, visitor (patients) parking numbered 5-8, a drop off park space numbered 9 and the existing disabled parking bay numbered 10. During assessments of the existing car parking area and analysis of existing traffic problems on site, it was discovered some other factors were contributing to existing problems, in addition to limited parking being available. Firstly, that the existing disabled parking bay is barely long enough to accommodate a vehicle and when a vehicle is parked in it,? it blocks access to the car parking bay next to it and also pedestrian activity on the footpath. It is considered this disabled bay can be reconfigured to be at a more appropriate angle for easier parking for this park itself and allow access into the space next to it. It is also considered a wheel stop can be provided to prevent drivers from running into the Medical Centre building and to encourage them to park as necessary, close to the building to avoid obstructing the pedestrian footpath. This has been incorporated into condition 4 of the drafted conditions. A further suggestion from Council staff is that an area on the south side of Marshall Way is also dedicated for one hour parking bays ? it is predicted 5-6 car park spaces could be accommodated. As the nearby residences do not front Marshall Way, it is considered appropriate to locate parallel parking with a one hour parking restriction. Furthermore, it is suggested that the restriction for ?one hour parking? is restricted only for week days from 9.00 am until 5.00 pm only; leaving the bays free to be utilised by residents or visitors to the residences outside of these times. These times being when the one hour parking bays can be utilised by visitors to the Medical Centre, although it is not possible to give them exclusive rights. These parking bays will be located across the road from the Medical Centre on Marshall Way and as such visitors will need to cross this road. It is therefore suggested that the applicant, at their cost, look at providing a safe pedestrian route from these bays to the Medical Centre, following the broken line in Figure 2. It is considered ramps to the kerb will need to be installed as well as a pedestrian refuge point within the existing blister. It is predicted that these parking bays will reduce the need for car parks on the opposite side of the road to Marshall Way where there is presently an issue with cars parked over the pavement causing a hazard for pedestrians. Discussions with regards to improving existing car park arrangements have included MTS throughout negotiations and his concurrence has been given to the amendments. The proposed revised parking layout will lessen the negative impact on the surrounding environment. The application site relates to a well established important community facility. The upgrade to the pedestrian route from the proposed one hour parallel parking bays needs to be at the cost of the applicant as per condition 4 or Council will inevitably bare the cost for such works sometime in the future. 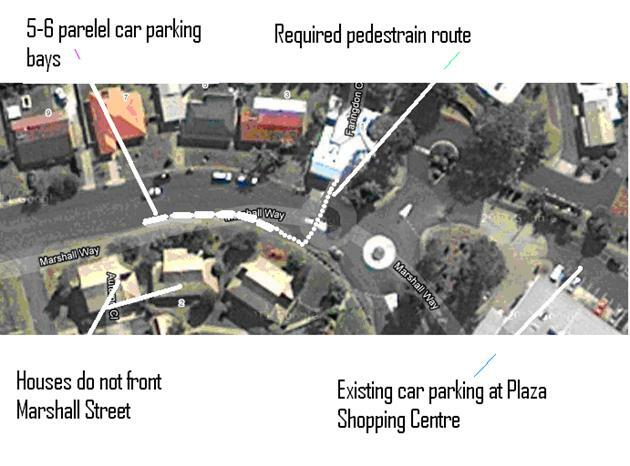 In addition, the proposal for providing parking bays on Marshall Way will need to be submitted to the Local Traffic Committee for consideration and the applicant will need to demonstrate a safe pedestrian route can be provided from the new parking bays to the Medical Centre, and following a favourable Local Traffic Committee recommendation being adopted by Council all works to be undertaken to provide the safe pedestrian route are to be at the cost of the applicant. 5??????? The application for a Construction Certificate is to include plans and specifications that indicate the landscaping of the site. Such landscaping plan must incorporate adequate detail to demonstrate compliance with the provisions of Nambucca Development Control Plan 2010. Such plans and specifications must be approved as part of the Construction Certificate. 6??????? All Plumbing, Water Supply and Sewerage Works are to be installed and operated in accordance with the Local Government Act 1993, the NSW Code of Practice for Plumbing and Drainage and AS/NZS 3500 Parts 0-5, the approved plans (any notations on those plans) and the approved specifications. 8??????? All builders rubbish is to be contained on site in a ?Builders Skips? or an enclosure. Building materials are to be delivered directly onto the property. Footpaths, road reserves and public reserves are to be maintained clear of rubbish, building materials and all other items. 10 ???? All demolition works are to be undertaken in accordance with the provision of Australian Standard AS 2601-2001 ?The Demolition of Structures?. Prior to demolition, all services are to be disconnected and capped off. 11????? At the completion of works an upgraded fire safety schedule is to be prepared and an essential fire safety statement issued, a copy of which is to be sent to Council, the Fire Commissioner and displayed on the premises. 12????? Adequate signage must be erected to direct people into the appropriate car parks i.e. those spaces dedicated to staff parking should be labelled ?staff only? or similar and those spaces dedicated for visitors parking should be clearly identified as having ?5 Minute? or ?One Hour? parking time restrictions on them. RE: D.A. #2012/004 for Bawrunga Medical Centre. Further to our discussions at Council last Friday, 13th April, 2012, we have conveyed your suggested parking proposals to Bawrunga Medical Service who are in agreeance. Please contact us on 0409891796 should you require further information. Bowraville Sewerage Treatment Plant (STP) has been unable to consistently meet the licence requirements that specify the minimum quality of effluent discharge from the plant.? Over the last few years there have been a number of occasions where the concentration limits for both Total Suspended Solids and BOD have been exceeded. Council has been able to manage this problem by reusing the wastewater for irrigation purposes on a farm that they own and lease.? However it is considered that it would be to Council?s advantage to improve the quality of effluent produced by the plant in order to prolong its useful life for as long as possible. Investigation revealed that constructed wetlands have been successfully used at similar STP?s on the Far North Coast to polish the final effluent being discharged to the environment. The Water and Carbon Group have a record of involvement in these projects and they were engaged to investigate and prepare a report on the feasibility of utilising this approach at Bowraville STP.? A copy of the report is circularised for Council?s information. The report concludes that a constructed wetland could be readily integrated into the existing treatment plant site and that it would result in a more consistent effluent quality that would easily comply with existing licence requirements.? On this basis it is recommended that Council pursue the design and construction of a wetland as part of the treatment train at the Bowraville STP in accordance with the option outlined in the report for the estimated cost of $435,000. 1??????? That Council allocate funding of $450,000 spread across the 2012/13 and 2013/14 budget years for the design and construction of the proposed constructed wetland. 2??????? That Council seek a fee proposal from suitable companies for the preparation of concept, detail design and documentation for the proposed constructed wetland.? Council has been able to manage the problem by setting up an effluent reuse system on a farm that they have purchased.? The effluent is disinfected during transfer to a farm dam which provides additional detention and settling time further improving the quality of the wastewater.? The farm is leased under the condition that as much effluent water as possible must be used on the farm for irrigation purposes.? The problems mainly arise during prolonged periods of wet weather such as that which has occurred over the last 3 years.? During these times there is considerably less demand for irrigation water and effluent overflows to the river occur at the treatment works site. The existing STP is a valuable asset for Council and with Bowraville unlikely to experience significant population growth it is to Council?s advantage to take action to prolong its useful life.? Recent improvements have been made to the plant in the form of new sludge drying beds and the installation of an automatic screening system at the inlet.? The later is removing a lot of solid material upfront and is having a significant impact on the quality of the effluent. The effluent quality is also affected by algae growth in the tertiary ponds as this brings about an increase in the concentration of suspended solids.? This organic matter also reacts with the disinfection chemicals and means that larger doses are required to achieve the desired results. Investigation has revealed that a number of Council?s in Northern NSW with similar problems have achieved a marked improvement in effluent quality through the use of constructed wetlands.? A wetland added to the end of a trickling filter plant and replacing a portion of the tertiary ponds has been proven to produce effluent with BOD and SS concentrations less than 5 mg/L.? This is significantly below licence requirements and better than results achieved at plants designated as ?modern technology?. The Water and Carbon Group have been directly involved in much of the work completed at Casino and Lismore and as a result were engaged to provide a feasibility report for the introduction of a constructed wetland at the Bowraville STP site.? The investigation and modelling indicated that a suitable wetland could be incorporated into the existing site and the expectation is that a much improved quality of effluent would be produced. The Bowraville plant has been identified for major upgrade or replacement in Council?s IWCM Strategy and this would incur a significant cost.? It is considered that the need for this work could be greatly delayed or even negated if a constructed wetland was included in the treatment train.? This option is considered to be a very cost effective and environmentally friendly way of polishing the final effluent from the plant and ensuring that a consistent, high quality wastewater is produced at the final point of discharge. It is noted that the wetland has limited capability to reduce phosphorous levels and this may be something that needs to be addressed in the long term.? However phosphorous is not a problem for reuse water and given that Council intends to continue to use the majority of wastewater for farm irrigation the quantity of phosphorous that is discharged to the Nambucca River is being greatly reduced. The incorporation of a constructed wetland into the Bowraville STP treatment train will have a significant environmental impact as a result of the expected improvement in the quality and consistency of the effluent being discharged from the plant. There incorporation of a constructed wetland into the Bowraville STP treatment train is considered to provide Council with a significant economic benefit by significantly delaying and possibly negating the requirement for a major upgrade or replacement of the treatment plant. The Nambucca Heads Senior Rugby League has requested funding assistance for the construction of a BBQ Kiosk at Coronation Park.? It is proposed that the kiosk will provide the club a means of raising funds to complete Stage 2 of the renovations of the old amenities building at Coronation Park. Council has previously resolved that renovations of the amenities building be completed without further funding from Nambucca Shire Council.? Furthermore it has been noted in previous reports that there was a risk Council may be approached for additional funding. Whilst this request for financial assistance is not directly related to the amenities building itself, the intent of the kiosk is to raise funds towards Stage 2 of the amenities building refurbishment.? On that basis it is recommended Council not provide the required assistance. 1????????? That $10,000 financial assistance to the Nambucca Senior Rugby League for funding the construction of a BBQ Kiosk at Coronation Park be considered in the 2012/13 budget. 2????????? That $10,000 financial assistance to the Nambucca Senior Rugby League for funding the construction of a BBQ Kiosk at Coronation Park be provided from working funds. The Nambucca Heads Senior Rugby League has requested funding assistance for the construction of a BBQ Kiosk at Coronation Park.? It is proposed that the kiosk will provide the club a means of raising funds to complete the renovations of the old amenities building at Coronation Park. In 2009 a new amenities building was constructed at Coronation Park to serve the senior and junior rugby league clubs.? At the time the intention was to demolish the old amenities building at the site as it was considered to be in very poor condition. A recommendation was made to Council in July 2010 to call for quotations to demolish the old amenities building and to advise the leagues clubs that they would be required to build separate facilities for beer, barbeque and hot chip preparation and sales at their own cost.? Following representations to Council by the leagues clubs Council resolved to defer a decision on demolition to allow the leagues clubs the opportunity to put a proposal to Council for retention of the old amenities building.? In February 2011 a report to Council recommended deferral of demolition for a further 3 months to allow the leagues clubs time to complete their proposal.? Council resolved to accept this recommendation.? In June 2011 a structural engineers report was received confirming that the old amenities building would be structurally adequate for the intended use once proposed modifications were carried out.? Following this advice a report to Council recommended a further three month deferral to the demolition of the old amenities building to allow the finalisation of plans for refurbishment and for the Coronation Park Trust to demonstrate their ability to fund the shortfall in funding for the refurbishment and ongoing maintenance.? It was also recommended that Council allow $19,200 allocated for demolition of the old amenities building to be used towards the refurbishment of the old amenities building.? Council resolved to accept these recommendations.? In October 2011 a report to Council recommended approval of the submission from the Coronation Park Trust for retention and renovation of the old amenities building subject to a number of conditions relating to the timing and conduct of the work.? The work was to be carried out in two stages.? Stage 1 encompasses all external works including the demolition of unsound sections of the building.? Stage 2 is the internal refurbishment of the building, other than the public toilets.? That report also recommended reallocation of the $19,200 allocated for demolition of the old amenities to the renovation works.? The report had a further recommendation: That the entire project be completed without further funding from Nambucca Shire Council.??? Council resolved to accept these recommendations.? The report to Council in October also noted that: ?The submission received from Coronation Park Trust fails to provide any detail as to how the Coronation Park Trust will raise funds to complete Stage 2 of the renovation works or to continue to maintain the building into the future..? That report also included the following comment on risk:? There is a risk that the allocated funds of $19,200.00 will not be sufficient to complete Stage 1 or that the Committee will not be able to raise the funds required to complete Stage 2. In either case the Committee may seek further funding from Council to complete the works. The Nambucca Heads Senior Rugby League has requested funding assistance for the construction of a BBQ Kiosk at Coronation Park.? It is proposed that the kiosk will provide the club a means of raising funds to complete Stage 2 of the renovations of the old amenities building at Coronation Park.? The club has obtained quotations for $20,135 for the construction of the kiosk and are seeking financial assistance from Council for $10,000.? These funds will be used to acquire materials for the kiosk. Their request suggests that there may be unspent funds available from Council?s maintenance budget that could be diverted to the kiosk construction.? At this stage there appears there will be minimal unspent funds in the maintenance budget by the end of the Financial Year. Following completion of the new amenities building an issue arose where players were experiencing minor electric shocks when using he shower facilities in the new building.? Remedial work was carried out to eliminate these shocks.? In investigating the cause of the shocks Country Energy identified an underlying issue with the power supply to the buildings.? Essentially the supply cables are not adequately sized for the present load in the buildings.? A suggested remediation is to increase the capacity of the supply cables and to upgrade from a single phase to three phase connection to allow better balancing of loads in the buildings.? Preliminary quotes indicate this work will cost in the order of $35,000.? The undersized cables result in the voltage at the buildings being lower than standard.? Measurements taken show voltage at 205V which is well below the standard level of 240V.? This does not pose an immediate problem other than perhaps reducing the efficiency of electrical appliances and increasing the risk of damage to those appliances.? The construction of a new BBQ Kiosk may contribute to additional electrical load and exacerbate the situation of reduced voltage at the site. The power supply issue will need to be resolved though and Council will need to allow money in future budgets for this purpose.? Funding for this work is in effect, competing with the request for funds for the kiosk. Council is aware of issues with two floodlight support poles at Coronation Park.? Whilst maintenance of luminaries is a Committee of Management responsibility, Council is responsible for the lighting infrastructure.? A discussion on remedial works for the poles is pending a review of lighting facilities across the Shire.? Given the prominent rule of Coronation Park it seem highly likely that Council will need to allocate funds for remedial works on floodlighting in future budgets.? Once again, funding for this work is in effect competing with the request for funds for the kiosk. The request for financial assistance has come from the Senior Leaguers Club rather than the Coronation Park Trust Committee of Management.? The Committee of Management has advised they support the allocation of any unspent maintenance funds to the kiosk.? As mentioned earlier, it is likely that there will be minimal unspent maintenance funds..
Council has previously provided close to $1M in funding to building works at Coronation Park.? Whilst Coronation Park is a major sports venue within the shire it is important that other sports venues and clubs receive comparable levels of support.? Further funding for facilities at Coronation Park reduces Council?s capacity to provide funding other venues. Provision of adequate levels of service from infrastructure assets contribute to the economy of the Shire. There is a risk that construction of the BBQ Kiosk, whether funded by Council or not, will increase the electrical loading at the site and require allocation of Council funds to resolving the electrical supply issues at Coronation Park.? This may occur sooner than Council would otherwise desire. The proposal requires expenditure above current budget allowances.? Funding of this request, if granted, will require allocation of working funds. A meeting of the Vehicular Access to Beaches Committee was held on the 13 April 2012.? The minutes of the meeting are attached for adoption by Council. 1??????? That Council continue with a series of media releases leading up to the holiday periods. 2??????? That the minutes of the Vehicular Access to Beaches Committee meeting on 13 April 2012 be noted and adopted. There is some illegal vehicle access to beaches that could cause environmental damage. Use of vehicles in unauthorised areas could lead to injury to other beach users. Funds are available in current budget through the income generated by the sale of beach permits. That the Committee note the adoption of the Minutes of the Meeting held on the 11 November 2011. The progress on the outstanding actions identified at the previous meeting held on the 11 November 2011 and presented to the meeting held on the 13 April 2012 be received and noted. 1??????? That the Financial Report as at the 30 March 2012 noting Income of $ 5307.00 and Expenditure of $ 3924.73 be received and noted. That the report from the Director Environment and Planning for the period September 2011 to March 2012 relating to the Ranger position be received and noted. That the report from the Parks and Reserves Supervisor as at the 29 March 2012 be received and noted. Georgette Allen??????? Dogs on beaches; flagged down 3 young men in 4WD?s near the cliff at Valla Beach. Thought they came in from Nambucca Shire side but had accessed beach through Bellingen Shire at Winona. Tony Hardge??????????? 5 dead She-oaks fallen in car park at Scotts Head need removal. The Director Engineering Services advised that he had discussions with the former Director Engineering, Wayne Butler, of Bellingen Shire Council with a view to their joining the joint Beach Permit operation with Nambucca, Port Macquarie Hastings and Kempsey Shires.? Bellingen Shire Council currently do not issue beach permits. That the verbal reports from the Honorary Rangers provided on the 13 April 2012 be received and noted. 1??????? That the Committee receive and note the report. 2??????? That the Committee recommend that Council continue with a series of media releases leading up to the holiday periods. The Committee noted the verbal advice from the Director Engineering Services that the various policies relating to beaches are going to be reviewed with the intention to combine into one policy.? This will be provided to the Committee in advance of the November 2012 meeting for comment. The Committee were advised by the Director Engineering Services that the questions for the polling will be developed in consultation with the Vehicular Access to Beaches Committee. 1??????? That the Vehicular Access To Beaches Committee receive and note the report that Council resolved to poll community attitudes to 4WD vehicles on beaches within the Nambucca Local Government area and that Council will be conducting this poll through the auspices of the 2013 Resident Satisfaction Survey. The next meeting will be held on Friday 9 November 2012 commencing at 1.30 pm. There being no further business the Chairperson then closed the meeting the time being 2.20 pm. Council has resolved at the March Ordinary Council meeting to receive a report on the non recurrent budget items (Capital Works) within the Engineering section. The report is presented for the period ending March 2012 (copy circularised for Councillors). It should be noted that the Authority costing system is still experiencing problems.? This report is based on the best available information extracted manually by the Manager Information Technology. The Manager Information Technology has provided the following comments on the problems which have been recently encountered with the Authority costing system. ?Civica releases regular patches for its Authority product on a bi-weekly basis. These patches are intended to provide prompt resolutions to problems occurring at customer sites however from time to time bugs are also introduced. When Nambucca applied patch 18 to our Authority 6.4 LIVE environment a bug was introduced that caused balances associated with work order expenditure to be misreported on both the enquiry screens inside the Authority product and custom reports written by Nambucca Shire Council. This issue is to do with the way individual transactions are managed within the accounts payable module. When a purchase order is invoiced and subsequently receipted, the amount is not correctly associated with the originating work order, hence the balances for that work order are not correct. The *cause* of the issue was recently resolved (after well over a month) and has been applied to our environments, however significant data corruption has occurred during that time. Civica are working on several fixes that will be run by consultants at affected sites. An email this morning suggests these will be ready on 24/4/2012, however with many sites being affected it's not known when Nambucca will be scheduled. The issue has caused significant stress for Nambucca Shire Council when required to provide reports to the RMS regarding expenditure relating to flood damage and has made expenditure tracking far more difficult. It may also have affected some budget preparation. We now have a relatively reliable program that identifies incorrect transactions associated with a work order and makes necessary adjustments. This was not attempted sooner due to the inherent risk associated with making assumptions regarding financial data in a system as complicated as Authority.? The attached spreadsheets reflect the expenditure for capital works for the March quarterly budget review period and will now be provided to Council each quarter as part of the Quarterly Budget Review (QBR). Council staff have been hampered in monitoring the expenditure with the issue surrounding Authority as detailed by the General Manager. This period of reporting has experienced substantial wet weather which has impeded or delayed some works which have been pushed back to the March ? June reporting period. The impact of the wet weather has reflected in the bridge construction program with the need for remedial works required to open roads following landslips and damage to rural roads. Council have been previously advised of the flood damage claims emanating from January and February storm events and the issues surrounding various landslips. The RFS identified capital works to buildings within the 2011/12 financial year for Eungai extensions $50.000 and Taylors Arm extensions $14.000.? This funding was subject to government matching grants which did not eventuate for the RFS and an allocation of $64,000 will not be required this financial year. In accordance with the recommendations from the RFS Liaison Committee and adopted by Council, unexpended funds are to be placed into a reserve to offset future budgets and the amount of $64,000 is recommended to be placed into a reserve for future budgets. There are two items of plant contained in the 2011/12 budget.? The RFS have advised that these will be procured by the end the financial year. The major rain events in January/February severely disrupted the works program with further rain in April also having a negative impact. Notwithstanding these disruptions, I anticipate the majority of the works program will be completed by 30 June 2012. There is one project, Weekes Bridge, which may overrun resulting in a revote of an amount yet to be determined.? This will involve mainly labour and plant costs. Projects identified as completed may still have accounts outstanding for payment and this is reflected in the column ?Expend to Finish?. Awaiting replacement of sewer main prior to road constructions. All works will be completed by 30 June 2012 in accordance with Natural Disaster Funding requirements. Side track washed out on several occasions.? Some claimed under flood damage.? Not all eligible. Material being purchased.? Construction to commence at the completion of Johns Bridge.? There may be some revote consisting of labour and plant costs. Internal house sewer required replacement.? Stages 1 & 2 combined into one project. Additional works approved during construction due to unforseen conditions.? Stages 1 & 2 combined into one project. Stages 1 & 2 to be combined into one project.? Clearing of open drain completed.? Pipe work to be carried out by contractor. (Commencing May). Geotech information received and pavement design being completed. Preliminary geotech investigation prior to detailed design, funds sourced from Developer Contributions. Funding for this project is part of the RMS block grant which is in untied allocation.? A major pavement failure on Scotts Head Road reduced the amount of available funds.? Other large pavement failures in Rodeo Drive were also considered a higher priority and hence given preference over this project. These projects will be completed together.? Detail design of the car park revealed available funding insufficient.? Savings within the Roads to Recovery (R2R) funds will be reallocated to this project. Project not required.? Funds can be reallocated. Works scheduled for 2010/11 were deferred due to DA application for a school on Dudley Street.? Funds were placed into a reserve awaiting the outcome of the DA (as DA conditions would have resulted in external funds to undertake the work in lieu of Council).? These funds have now been brought back to complete the project with the works to be completed by 30 June.. Wet weather has delayed the reseals, intermediate work on the shoulders has been completed.? Awaiting contractor confirmation of commencement date which is anticipated end April, these are short term and anticipated to be completed in one week..
Quotations received for the lighting were higher than the grant received.? Lower prices have been negotiated and awaiting Committee approval to proceed with reduced lighting output and higher level of ?in kind? contribution. Contractor continuing with the program, works have been subject to rain delays and the program will be completed by 30 June. The landslip remediation works along Riverside Drive have commenced and are anticipated to be completed by 30 June. A variation to the contract was approved when asbestos was found on one of the sites and had to be treated in accordance with Work cover requirements. The only anticipated revote at this point in time is the awning on the Bowraville Museum not being completed in 2011/12.? We are currently awaiting finalised designs in order to seek quotations for the work.? Timing will then be dependant on capacity of building contractors to complete work in 2011/12.? Potential revote of $8,500 to 2012/13 if work not completed. All planned plant purchases are complete or scheduled for completion by 30 June 2012. The five utilities which were initially intended to be leased are on order following Council?s resolution in November 2011 to revert to purchase of vehicles. Purchase of a compressor (general fund) and tractor/slasher (sewer fund) have been deferred.? Budget allowance for these items ($70,000) will be transferred to the Plant Reserve. Final commissioning of the plant was seriously delayed as a result of electrical problems associated with the automatic control of the aeration system and the UV disinfection system.? These issues have now been resolved and the new treatment plant is now in operation. However the delays have meant that a number of outstanding works are yet to be completed including demolition of the old works and upgrades and repairs to the existing IDEA tank.? Council is also holding $200,000 of retention monies for the contract.? As a result of these delays expenditure will occur in the 2012/13 budget, however, Council can still claim $1 million subsidy through the Country Towns and Water Scheme upon completion of the project. When the budget was prepared in early 2011 the program for the project allowed for construction commencing in March 2012. Council?s attempts to obtain funding commitments from the State Government and delays in completing the detailed design have meant that the project has been delayed.? Construction will not commence until August 2012 subject to Council decision on the tenders, and therefore the $9,000,000 will be required as a revote into the 2012/13 budget. The expenditure required from reserves and loans have not been drawn down for this financial year as they are not required until the 2012/13 financial year. Development approval has been granted for subdivision at South Macksville and when the budget was prepared for 2011/12 it was envisaged that the development would have progressed to a stage where Council would have had to commit to commencing the pump station works. This has not been the case and construction works are being postponed until they are absolutely necessary and as a result no further expenditure will occur in 2011/12.? However the developer has commenced work on site and pump station construction will have to be undertaken in 2012/13 and hence a revote has been requested. This work will be funded from reserves and revenue collected from developer contributions. At this point in time, expenditure is on track for completion of the capital works program which encompasses the revotes emanating from the 2011/12 financial year. Staff have identified some works that may progress into the first quarter of the 2012/13 financial year as a revote. No issues associated with this report. Wet weather remains a risk to Council?s works program.? This year has seen substantial storm and rain events which has impacted or delayed some projects.? The development of the works program allows for staff to monitor the progress and make the necessary adjustments to delivering a completed program. Undelivered projects due to delays attributed to weather may require a potential revote. The results varied and an interim report from the Manager Civil Works together with an activity summary report from NorthPipe Constructions is attached for Council?s information. An Asphalt Zipper has been trialled for use in the restoration of large pavement failures (heavy patching). An interim report has been prepared on the findings to date.? The machine trialled was extremely efficient at ripping and mixing existing pavements however, its relatively large size and design limited its use on small patches particularly in urban areas.? Further, trialling on larger rehabilitation projects remains an option. In order to compare the overall value of this machine further trials are being undertaken using two other contractors with different equipment. A further report will be prepared once these further trials have been completed. Improved rehabilitation techniques will lead to more efficient movement of vehicles and reduced vehicle operating costs benefiting both private and business road users. The 2011/12 budget contained an allowance for urban and rural heavy patching. There are no variations to working funds attributed to this report. 1.1?????? Council?s sealed road network consists of 104.5 km (915,000m2) urban streets and 247 km (1,600,000m2) rural roads. 1.2?????? Limited funding over many years has resulted in full reconstruction being replaced by a program of cement stabilisation as the preferred method of rehabilitation as a means to treat a greater length of the network.? This reduced treatment combined with reduced roadside mowing and several wet seasons has let to an increased number of large pavement failures. 1.3?????? In October 2011 Council was advised of a new machine (Asphalt Zipper) which had been recently imported from the United States of America.? In order to test its capabilities and options available for the restoration of large pavement failures a trial was arranged for November 2011. 1.4?????? A contractor was engaged to undertake the trial. 2.1??? There are two main causes of large pavement failure. 2.2?????? Firstly, aging pavements.? The gravel pavement loses its compaction and strength that can lead to sinkage over large areas. 2.3?????? Secondly, water in the pavement.? This weakens the gravel and leads to the subgrade, often clay materials, pumping through the pavement causing heaving.? Water in the pavement is usually the result of poor drainage and a lack of shoulder maintenance.? Over recent years a reduction in roadside mowing has resulted in grass and material in the shoulders building up higher than the bitumen seal hence retaining water in the pavement. 3.1?????? In preparing the 2011/12 budget Council recognised the fact that the sealed road network required significant funding to rectify large pavement failures.? Allocations of $200,000 and $250,000 were included in the budget for rural and urban roads respectfully. 3.2?????? This interim report will concentrate on the remediation of the failed sections using the Asphalt Zipper in conjunction with other earthmoving equipment.? 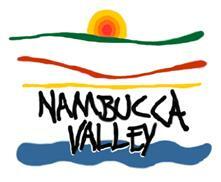 The trial focuses on failures on Gumma Road and a patch in Nambucca Heads. 3.3?????? The effectiveness of a trial of this nature can be difficult to assess as the aim is to carry out works that will provide a cost effective, long term benefit.? The success of any one treatment may not be evident for months or even years after the works. 3.4?????? The adopted method also needs to take account of the condition of the surrounding pavement.? It is of little benefit to treat a patch for a life of 30 years if the adjacent pavement only has a life of 5 years.? The primary objective is to remove an immediate hazard in order that the overall pavement may reach the end of its service life. 3.5?????? A preliminary cost of heavy patching is estimated to be $100 per sqm.? The trial will provide a more accurate costing. 4.1?????? The contractor was given a brief to undertake repairs to large pavement failures based on the use of the Asphalt Zipper.? Information on the company website indicated similar use by various councils in the United States. 4.2?????? The Zipper is essentially a pavement recycling machine that rips an existing pavement and mixes the insitu material ready for relaying.? For the trial there were no geotechnical pavement tests taken prior to the works.? Therefore, onsite assessment of treatment options was required. ???? Rip and modify the material using cement, lime or other stabilising agents. 4.4?????? The contractor was required to keep records of location, method, equipment used and costs. 5.1?????? The Zipper proved to be very efficient in ripping and mixing the existing pavements.? However, this efficiency resulted in considerable idle time while waiting for the remainder of the process to be completed. 5.2?????? A number of teething problems were experienced as this was the first time the machine had been used in Australia.? It is now evident that the United States have different (lesser) workplace safety and vehicle operating standards.? Whereas in the United States the Zipper can be used on small loaders and transported on a trailer and utility, a much larger loader and truck transport is required in Australia to meet the relevant legislative requirements.? This limits the flexibility of operations.? In particular, the large loader and the position of the Zipper in the bucket make it impossible to excavate up to existing kerbs in urban area thus requiring an additional process. 5.3??? A copy of the contractor?s report is attached as Appendix A. 5.4?????? In assessing the effectiveness of the Zipper, two factors have impacted on the quality of the patches.? 5.5?????? Firstly, rain throughout the trial caused delays and had a negative impact on placement and compaction of treated material.? This could lead to early failure and higher costs due to reworking.? Secondly, the lack of familiarity with the machine slowed the process thus increasing costs. 5.6?????? The contractor has reported his costs to equate to approximately $72 per sqm which is an average for patches excavated to a depth of approximately 300 mm. 5.7?????? Initial inspection of these patches has indicated some failure particularly along he shoulder area where the Zipper could not access and where substantial additional drainage works would be required at additional costs.? There were also some problems with temporary seals and stripping of aggregate. 6.1?????? The Zipper performed its part of the operation extremely well in the rural area but was very limited in the urban situation.? There are smaller versions of the Zipper available that maybe more suitable for urban patches. 6.2??? It is evident the larger the patch the more efficient the Zipper becomes. 6.3?????? For heavy patching the Zipper is limited to a depth of 300 mm whereas some locations may require deeper dig outs (sometimes greater than 600 mm) thus requiring more conventional machinery such as an excavator. 6.4?????? As stated, the Zipper is effective in its part of the operation, however, overall success is a factor of the particular site conditions, especially the depth of existing pavement and the sub grade quality.? Uncertainties in this area could be overcome by geotechnical investigation at each site to determine the appropriate solution.? This would be at an additional cost of up to $15 per sqm for a patch 20m long by 4m wide. 6.5?????? In order to fully assess the heavy patching activity it will be necessary to undertake further trials for comparison against the costs determined so far. 6.6?????? In conclusion, large pavement failures can vary in cause and extent and no one solution will apply cross the board.? Each road and location will need assessment to determine the most appropriate solution. 7.1?????? The contractor engaged to undertake this trial has indicated that he considers other options are available as alternatives for the Asphalt Zipper.? This would be based around a smaller Skid Steer Loader profiling attachment.? Availability of this type of equipment is being investigated. 7.2?????? In order to compare processes and relative costs, further trials have commenced on both Taylors Arm Road and Wilson Road. 7.3?????? The Taylors Arm Road trial is being carried out using traditional methods using an excavator to depths up to 600 mm, installation of subsoil drainage and geofabric, rock fill and new road base material.? Initial indications are that this process will cost in the order of $145 per sqm. 7.4?????? A further trial is also being arranged using a different contractor with dedicated road profiling equipment.? This trial will also incorporate geotechnical investigation and a pavement design. 7.5?????? Once the trials have been completed Council will have a range of treatment solutions that can be considered for application on a job by job basis. ????? The council hired front end loader from conplant could not hold the weight of the asphalt zipper (3.9 tonne) in the front bucket so delays were present whilst another replacement loader could be found and loaned from a local quarry. ????? Once milling production commenced the road was milled to depth of 300mm using the asphalt zipper. This was achieved in a timely manner as the asphalt zipper was found to be very quick in this process. ????? Agreement was made to remove half the depth (150mm) of pavement into an onsite truck and commence compaction of the remaining milled pavement (150mm) with an onsite 7t smooth drum roller whilst waiting for the replacement roller to arrive. During this process mechanics were able to free the broken down roller to enable it to be moved to the side of the road. ????? With the use of an under sized 7t smooth roller we proceeded to compact the pavement to our best ability with storms approaching. ????? Pavement found to have excess moisture thus resulting in an area of 70m2 removed and replaced with 2 layers of roadbase (300mm total depth) over geo fabric. ????? This area was then trimmed and compacted to final height as well as the table drains reshaped and cleaned. ????? The use of the combined asphalt zipper (4 tonne) and the front end loader (15 tonne) would be more suitable for rural roads and not urban areas wether rural residential or residential due to the sheer size of the machinery. ????? The weight alone causes unworked pavement to fail due to the weight of combined machinery resulting in more work needed. ????? Whilst the speed of the milling process was deemed very efficient, the very same process could be achieved with different machinery with cost reductions in not having as many machines on hand. That Council provide a submission to the LGSA advising Council endorse Option 1 within the discussion paper ?Retracting Local Governments operational involvement with the RFS ? Council would recall the many reports over the past two years on the significant increases imposed on Council for the RFS contribution.? The Discussion Paper: Review of Local Government Engagement with the RFS, outlines the past and present engagement of Local Government with the RFS and proposes the following options for the future. Option 5?????? Maintain the status quo. Councils are requested to comment on their current arrangements with the RFS, Identify issues/problems commonly arising and highlight any current arrangements that are considered effective and clearly indicate a preferred option. The feedback received from the discussion paper will be collated and reviewed to help develop a new policy position on the future engagement of NSW Local Government with the RFS. There is the continued risk of an ever increasing RFS contribution and lack of accountability.